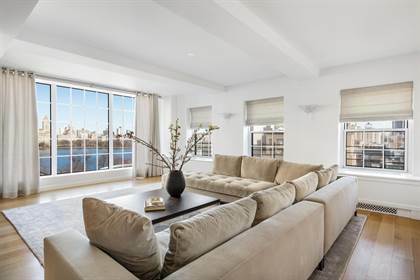 This brand new condominium penthouse with over 4,000 SQF has floor to ceiling panoramic views of Central Park, Guggenheim Museum and Jacqueline Kennedy Reservoir. Very quiet street. The pre-war building underwent gut renovation and upscale design in 2018. This state-of-the-art 4 bedroom penthouse (plus a separate windowed maid?s room/office) with oversized kitchen, separate dining and living rooms was completed from ground up in 2018 by combining 3 apartments. This 24/7 full-service, white glove condominium building boasts just completed fitness center, courtyard garden, lounge and playroom. Hi, I'd like to find out more information about 12 East 88th Street. Thanks so much!